The Thinkers programme on Democracy & Disinformation found its origins in the position paper of the Academy “The battle for the truth. Fake news and disinformation in the digital media world”. Co-editors Jaak Billiet, member of the Class of the Humanities, and Peter Van Aelst, alumnus of the Young Academy, took the initiative to organize a Thinkers programme on issues that needed further documentation and reflection. The aim of this programme is to focus on the influence of disinformation on democratic processes and the question why disinformation finds such popular footing, at what times and in which types of media. Together with a Steering Committee and two international experts, Anja Bechmann and Ben O’Loughlin, a set of activities and interactions with stakeholders will take place in the first half of 2019. A closing symposium where the Thinkers present their findings will be organized at the Flemish parliament on Friday October 11, 2019. She is board member of the Danish Council for IT Security and ATV's Digital Sages and appointed member of the Academy of Technical Sciences. Her research has been funded by national and international research councils such as the Danish Council for Independent Research, Swedish Research Council, Danish Agency for Science and Innovation, Horizon 2020 and Aarhus University Research Foundation. 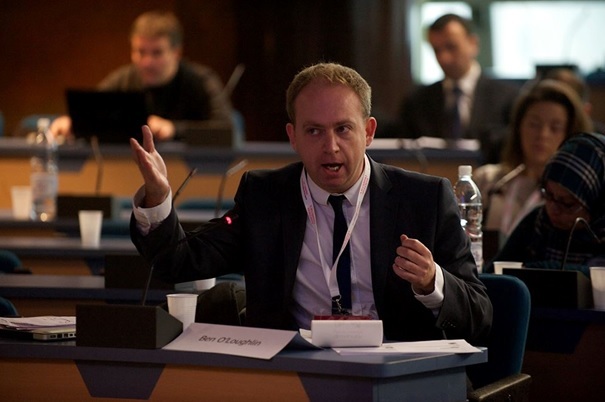 Ben O’Loughlin (DPhil Oxon, FRSA) is Professor of International Relations and Director of the New Political Communication Unit at Royal Holloway, University of London. He was Specialist Advisor to the UK Parliament’s Select Committee on Soft Power, producing the report Power and Persuasion in the Modern World. He is co-editor of the Sage journal Media, War & Conflict. In 2017 Ben published Forging the World: Strategic Narratives and International Relations (Ann Arbor: University of Michigan Press, with A. Miskimmon and L. Roselle, eds.). Ben has recently completed several projects on digital engagement with the British Council. In 2016 Ben and his co-authors won the Walter Lippmann Award for Political Communication at the American Political Science Association (APSA). He is currently completing a book examining the role of narrative in the 2015 Iran nuclear deal.